So, we’ve arrived in Israel and had an afternoon of tours, then a great day visiting Masada, Ein Gedi, Qumran, and a evening drive up to Tiberias. 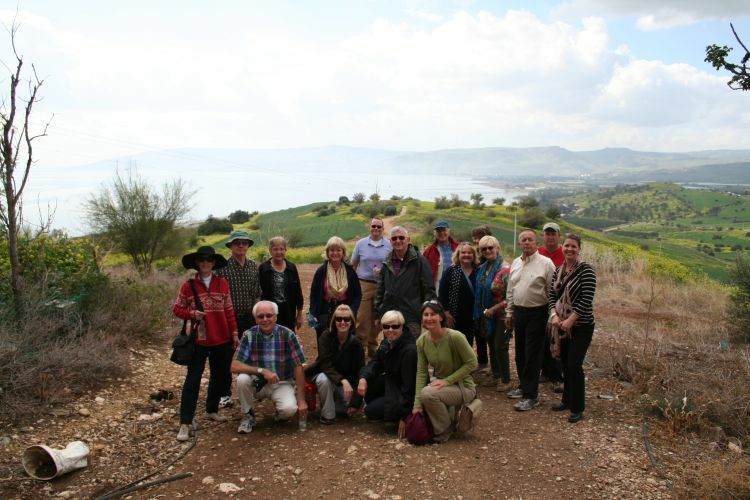 We had a great night’s sleep at the Golan Hotel and woke up quite early for a full day of touring The Galilee area. 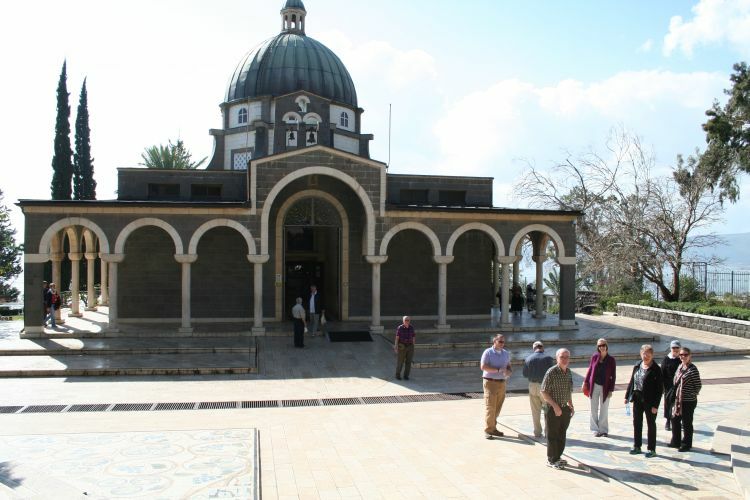 We started at the Mount of Beatitudes, the historically accepted site of Jesus’s Sermon on the Mount. In stark contrast to the wilderness around Masada, the Mount of Beatitudes is a verdant series of gardens with colorful flowers, benches among the vegetation, and beautiful views from the hill down to the Sea of Galilee. We toured the Roman Catholic church on the site. The church has mosaic tiles across the floor and images on the dome that show the Beatitudes. After quietly visiting the church, our group looked around the grounds for a nice place to have a short worship service. Settling on a shelter overlooking the Sea of Galilee, we settled in to begin our service. Almost immediately, another group arrived and announced that they had reserved the site and we needed to move along. Members of this group grumbled and shot us sideways glances, as if to imply “How dare these Protestants try to use this shelter”. I couldn’t help but chuckle a bit. As I’ll discuss later, some of the biggest conflicts in the Holy Land aren’t between different religions, but between different sects of the same religion. What a boost to ecumenical relations if our Catholic friends would have invited us to share their worship. In spite of this, we continued our stroll around the grounds and found a small garden area with a few benches and paused to reflect on the Sermon on the Mount and the lessons contained therein. Leaving the Mount of Beatitudes, our group split up, with a handful of us heading down part of the Jesus Trail to the Sea of Galilee and the remaining group boarding the bus and traveling to the Tabgha, the site of two important churches: The Church of the Primacy of St. Peter and The Church of the Multiplication of the Loaves and Fishes. Following a quick visit to each site, we headed to Ali’s Restaurant, on the shores of the Sea of Galilee for a traditional lunch of St. Peter’s Fish. 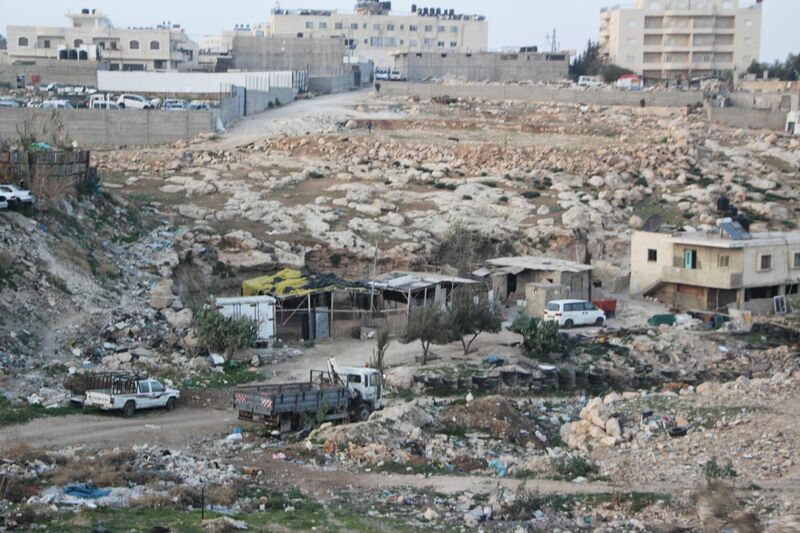 Ali has recently relocated from his old location because his land was seized by the Israeli government, and after a long court battle, Ali lost and his restaurant was demolished. The new location is amazing, though, with a large lawn full of tables and some inside seating. Lunch is served at long family style tables and there is an abundance of fresh salads and fresh bread for all to enjoy. Tilapia is a pretty plain fish, but the presentation of the whole fried fish is beautiful, and the hospitality you will experience here is worth stopping. After lunch, we traveled to Capernaum, the home of Peter and where Jesus performed a number of healing acts. 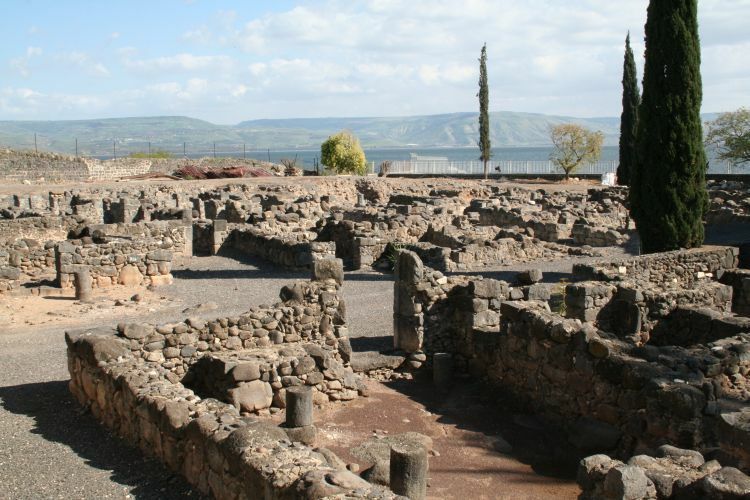 Capernaum is a historical and archeological treasure, with Peter’s house and one of the oldest synagogues in the world. The synagogue is actually two, with two sets of ruins in the same place, though it is clear they were built at different times. While in this area, we decided to visit the Kibbutz Ginosar and see the Jesus Boat. Now, the boat has absolutely nothing to do with Jesus, save that it was likely built in the 1st Century and likely resembles the boats that the apostles would have used. I’ll admit, I did not have high hopes for a two thousand year old boat that was found buried in lake mud, but this turned out to be a great spot to visit. In addition to the boat, there are some interesting art installations on the site. 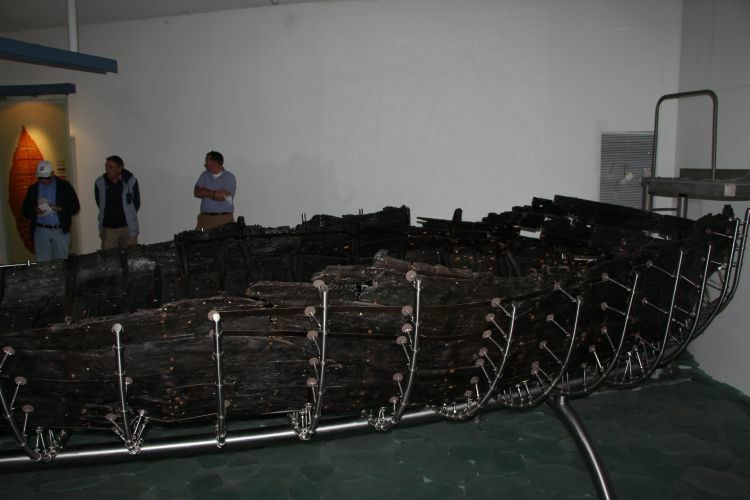 While the actual boat was interesting to me, the most fascinating information, for me, was the process they used to extract, preserve, and display the Jesus Boat. Truly worth you time. Our next stop was downtown Tiberias, where we embarked on a cruise on the Sea of Galilee. We had a great time on this sunset cruise, enjoying the cool early evening, the calm seas, and the great company. 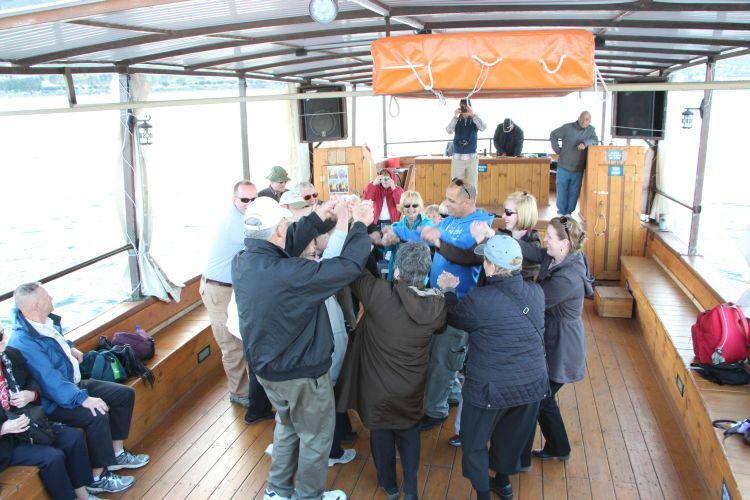 After cruising for a bit, we slowed to a stop and learned how to dance the hora. After a quick lesson and a few attempts, we decided we might be better off fishing… The captain opened a hatch and pulled out a cast net. My eyes lit up; living in Beaufort, even for a few years, it’s important to know how to throw a cast net. My technique is pretty bad, though, and I didn’t want to embarrass myself. However, a member of our group is a true waterman, so we talked the captain into letting him try his hand. Though Bobby didn’t catch anything, I admit I was moved by the connection that water creates. Here, thousands of miles from home, in a different culture, the waterman’s tools are the same. Returning to the dock, our group broke up so people could have some downtime. A small group of us visited the Scots Hotel. Beautiful place and absolutely top notch service, though the drinks will lighten your wallet pretty quickly. I covered our events of the first day here, so if you haven’t read that yet, you might want to catch up a bit. The second day in country was an early start. We met our bus and driver after an early breakfast and headed east towards the Dead Sea and Masada. Once you travel over the hills outside Jerusalem, the entire landscape changes dramatically. Although all of Israel and Palestine is desert, the western part of the country does get a bit of rain coming off the Mediterranean. But the hills east of Jerusalem prevent most weather from traveling to that part of the country, so you’re really seeing an extremely dry part of the world. As we left the Jerusalem area, we passed through a checkpoint and entered the West Bank, territory occupied by Israel since 1967. Getting into the West Bank is not terribly complicated, but returning to Israel proper is a bit harder. 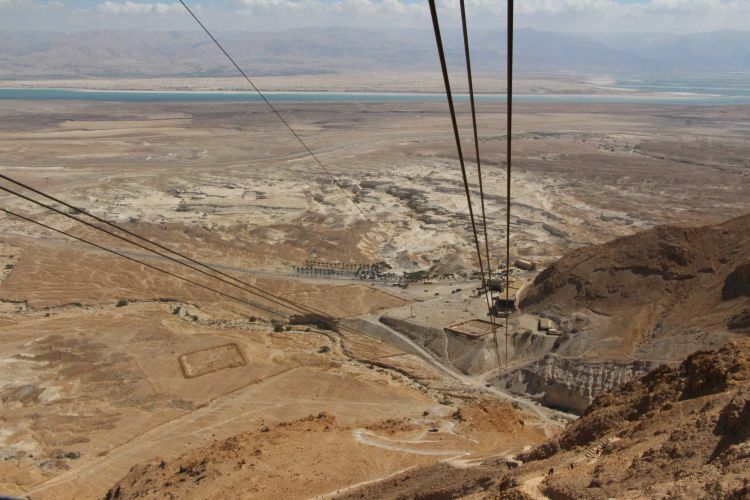 As we traveled deeper into the West Bank, the terrain sloped down gently, dropping to 1,401 feet below sea level when we arrived at the Dead Sea. As you travel down the west coast of the Dead Sea, Masada becomes visible long before you get there. Although there are a number of significant hills, Masada stands out because of the flat top that’s immediately noticeable. With such a large group, we chose to take the cable car to the top of the mountain, although a walking path is available and provides a beautiful view of the surrounding area as you hike up. Masada is known for the Siege of Masada, where Jewish rebels resisted troops from the Roman Empire. You can read more about the Siege at Wikipedia, but the Jewish stronghold was compromised by a siege ramp built by the Romans. Upon arriving at the top of the mountain, the Romans discovered that the entire population of rebels had committed suicide instead of being captured. What was most amazing about Masada, to me at least, was the ruins of the Roman encampments, still visible from the top of the mountain. After an excellent tour of the top of Masada, we traveled back down to the visitor center and boarded the bus for our trip to the Dead Sea. 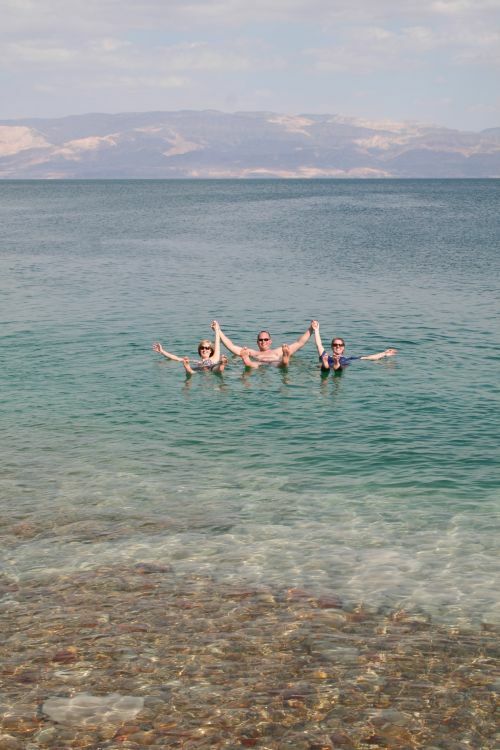 It’s nearly impossible for me to describe the feeling of floating in the Dead Sea. imagine trying to hold a ping pong ball underwater with only one finger. In fact, it’s nearly impossible to float vertically in the sea, as the salinity causes you to float on your back. A word to the wise: Do not taste the water. It’s not just salty, but has a very bad metallic flavor that you just can’t shake. One thing you’ll notice as you enter the water is the salt crystals built up on the rocks. They are very sharp and can easily cut your feet and legs, so I recommend wearing water shoes to get into the water. You’ll also want to take a shower before you leave, as the salt can be very irritating. Our next stop was Qumran, site of the discovery of the Dead Sea Scrolls. For me, this location was not as awe-inspiring as Masada or the Dead Sea, but much more meaningful. You can read the biblical stories of the wilderness and imagine the desert that is frequently referenced therein, but until you actually see this place, it’s nearly impossible to appreciate the barren and solitary nature. As you look out over the caves where the scrolls were discovered, you feel the strong wind, whipping down the eroded hills and cliffs. You feel the sand blowing against your face, the dryness of the area noticeable in your dry lips. Looking around, the stories of solitude, of temptation, take on a new and deeper meaning. Leaving Qumran, we traveled by bus north to Tiberias and The Galilee. While entering the West Bank is reasonably simple, returning to Israel is a bit more involved. We stopped at a simple checkpoint and waited as three armed IDF soldiers walked the aisle of the bus and checked the luggage holds. Not invasive at all, and the IDF soldiers were always professional and courteous, but a significant change from our entry into the West Bank. Our journey took us up Highway 90, which parallels the Jordan River.. As we passed the edge of the central mountains, the landscape changed a little, with more vegetation and life becoming visible as our journey continued north. Arriving at the Golan Hotel, the group disembarked, checked into our rooms, and then enjoyed a huge Middle Eastern feast at the hotel restaurant. A few of us stayed up, enjoying the cool Galilee evening and good wine and conversation as we prepared for another full day touring The Galilee. Heather and I have recently returned from a (roughly) 10 day trip to Israel and Palestine. Along with the other associate pastor from Sea Island, the three of us lead a group of 29 people through the Holy Land, visiting a number of historical and religious sites along the way. Well, Heather and Jack lead the group, I helped with some of the logistics when we were delayed for two days (Thanks United Airlines). Anyway, it’s taken me almost a month to sit down and unpack all the events of the trip. I’m going to try to walk through this trip a day or two at a time, along with pictures and some details. We arrive in Israel on Monday morning and traveled by bus to Tantur, our home base. Tantur is in a wonderful location, overlooking Bethlehem and very close to Jerusalem. When Heather and I traveled to the Holy Land in 2005, we also stayed at Tantur, though they have started catering to more groups than when we were first there. After lunch and a short rest to clean up, we headed out by bus again for a tour of East Jerusalem with a guide from Rabbis for Human Rights. Our first stop was a school serving Palestinian children in East Jerusalem. 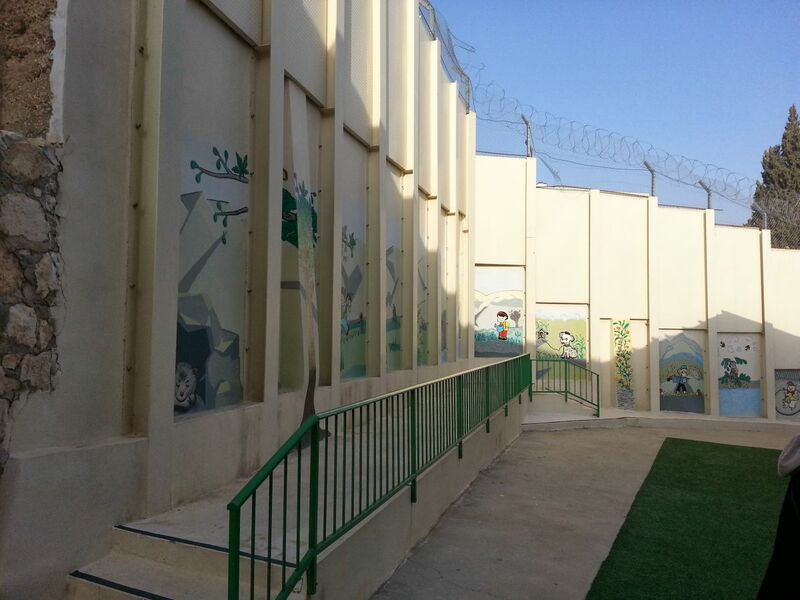 This school has been seriously impacted by the construction of the separation wall. The wall actually cuts off the school from the children and neighborhoods that they serve. What was most striking to me was how much this school looked like the school at our church, except for the razor wire.